banish all expectations of decadence elegance and baroque chambers of horrors. So far as characterisation is concerned, this is a tough, extrovert reading of the play, with characters in the early scenes as unbent as it is possible for them to be in Jacobean tragedy… No liberties are taken with the text, but the sensation is of seeing the play afresh. she rises by visible degrees to the grand scale, presenting every phase of her courtship an clandestine married life in vivid emotional detail before the horrors descend. When they do, she exhibits all the physical collapse of total despair before regaining human dignity. Again, nothing heroic is imposed on the character; everything has been thoroughly imagined. 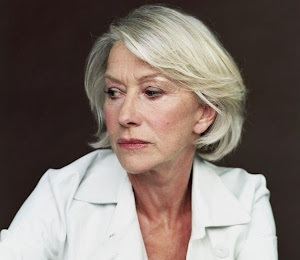 There are passages in the torment scenes when Helen Mirren lapses into a dull intensity that taxes the attention, but the whole shape of the performance, from the joyous games to the willing embrace of death, constructs an image of nobility with authentic human materials... The Duchess is more than usually isolated as the only figure combining virtue and power. The virtue of playing up the horror is that it makes the inherent moral goodness of the Duchess an even more powerful moral antidote. 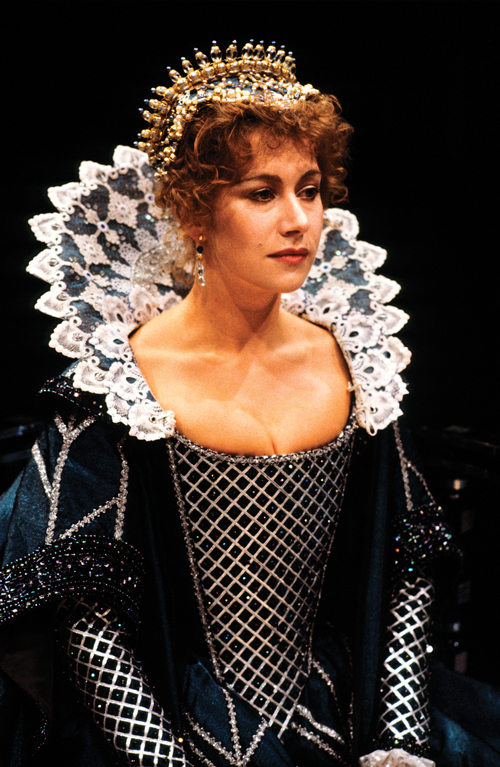 Helen Mirren also plays her excellently as a woman of strong sexual instincts who yet has a reassuring nobility of character. Helen Mirren starts out a trifle cool, especially when choosing a husband; she is better at giving orders than at giving herself. But she rises to the prison sequences. Her actual execution – with the strangling of her maid as its electric coda – is superbly done. In the eyes of the Jacobean audience they are above all culpable, and their strength – the ways in which they direct the action, scheme and orchestrate, evade the consequences of their impulsive decisions, and ultimately face resolutely the final outcome – need to be seen in this context. 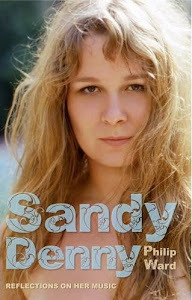 A fearful madness: I owe her much of pity. More perfect in her tears, than in her smiles. This raises an interesting question. When a text floats free of its historical context, is it our duty to put it back into that context, or to place it in our own context, regardless of what the original “meaning” may have been? Here, emphases may differ between theatre practitioners and academic critics, the latter more concerned with reconstructing historical “meaning”. And what of the dramatist himself? Do we see his attitudes as historically determined, or do we say, as Ben Jonson said of Shakespeare, that “he was not of an age, but for all time”, gifted with a breadth of vision that transcended his circumstances? Sure it is that Webster makes the Duchess a sympathetic figure, aided by his skills in fashioning dramatic architecture and muscular, speakable verse. Quality writing is a stuff that endures, even over centuries and across languages. But do we credit Webster, as we do Shakespeare, with a capacity, if not to challenge, at least to call into question, the status quo? Should we regard these dramatists as ethical futurologists, the counterparts of those Victorian and Edwardian pioneers of science fiction who anticipated aeroplanes and televisions, inventions unrealisable in their day but thinkable to those with minds capacious enough? We laugh at the way the eighteenth century “improved” Shakespeare, rewriting plays to conform to the classical unities or giving King Lear a happy ending. But there was a mad consistency in such modernisation that may be lacking in our pick-and-mix approaches. Viewing The Duchess of Malfi today, we suspend our historical sense in the early part of the play, flattering ourselves that the Duchess is a Cosmo girl in a “feminist” play and reassuring ourselves of the continued “relevance” of a 400-year-old text. Then we reimpose the sense of history later, as we must if we are to accept the plot development and the climax. We accept that behaviour such as the Duchess’s can only end badly for an aristocrat in early modern Europe; but not as badly as the play depicts, since widows enjoyed privileges of action not available to wives or unmarried women. The grand guignol conclusion, the stage piled high with corpses – these things we accept (if we accept them at all and the last Act is not to be played for laughs) as literary conventions, a Jacobean ratcheting-up of the mechanisms of Elizabethan revenge tragedy. Thanks for the link. I look forward to seeing Gemma Arterton in the role on BBC Four on 25 May. Me again. Yeah, the 2014 version was a bit disappointing wasn't it? I don't know, maybe the clip of Helen Mirren playing the Duchess spoiled me. I love how Helen says 'and like a widow I use but half a blush in't.' Courageous, passionate, defiant.